Cosmetic surgery SEO has the potential to attract the right visitors at the right time. Using this proven marketing strategy has the potential to generate significant ROI by attracting only the most relevant audience to your practice. SEO for cosmetic surgeons stands for “search engine optimization.” All major search engines, like Google and Bing, have organic search results where web pages, like plastic surgery blog posts and videos, are displayed and ranked based on a set of criteria that search engines deem important and relevant to users. If you already know you’re looking for a high-quality SEO company in Houston, then we’ll cut to the chase. Contact MARION today to outline your goals and get a quote for the strategy that will work best for your practice! How Can Plastic Surgery SEO Help My Clients? To attract the right visitors, your plastic surgery practice’s web pages must rank well for keywords relevant to your services. To rank well, you must provide the most valuable and relevant information to your users. Provide relevant and helpful information by addressing frequently asked questions for your clientele. Additionally, you can generate high quality information by providing before and after images of your procedures to demonstrate the effectiveness of your plastic surgery services. You can also improve your plastic surgery SEO by describing in detail the process of each procedure so that clients can form accurate expectations and mentally prepare for their operations. There are several benefits of using SEO for cosmetic surgeons as compared to other marketing strategies. Higher ROI – Search engine optimization offers recurring returns, if done in a non-deceptive manner. The steady development of authority through blogging, acquiring backlinks and sound website coding can linger if you use white-hat SEO. Compounding Returns – Because of the lasting rankings that can be had when proper plastic surgery SEO is implemented, your relevant traffic compounds over time. Even as you build backlinks and authority, your web pages will rank for more and more long-tail keywords and be deemed more relevant to more searchers. This drives the right traffic to your site and has a significant effect on the bottom line of your practice. Visibility Beyond Search Engines – To build backlinks and create social signals, you have to form partnerships with leaders in related industries and develop an engaged audience on social media. Your plastic surgery internet marketing will be developed as a whole during the SEO process. How Does the Cosmetic Surgery SEO Process Work? According to research by Brafton, 89% of consumers turn to a search engine before making a purchase. If you want to take your product to market, you now know where to find them. Unless you’re new to the industry, you’ve probably already invested in a website for your practice. It may be very aesthetically pleasing, but unfortunately, many designers don’t know or don’t care to implement the proper coding for plastic surgery search engine optimization. For instance, your website might be resource heavy. It could include several stunning high-resolution images with an autoplay video on the homepage. If these resources are not optimized correctly, they could be driving your site speed up, destroying your organic rankings and causing a bad experience for visitors to your website. Technical SEO for plastic surgeons can help reduce your site speed, which will have a positive impact on both your desktop and mobile rankings. Beyond rankings, improving your site speed will help streamline the experience of your users, and keep your prospects and current clients happy. Creating pages that outline each of the cosmetic procedures you offer is a critical part of your plastic surgery digital marketing strategy. To the untrained eye, it may be easy to figure out what you page is about. For search engines, it may be difficult to parse your text and learn why your services are any better than the competitions. On-page SEO for surgeons can help set you apart from your competitors by making it clear which services your practice offers and why you’re better than the next doctors. Optimizing the message of the copy and images on your service pages is the first step toward improving your rankings in organic search. By incorporating the right keywords in the right places on your pages, you’ll have a leg up on the other cosmetic surgeons in your area. If you’ve done some of your own SEO research, you might be asking – are keywords still important for SEO? While targeting a single keyword is a thing of the past, focusing your page on a thoroughly researched related group of keywords is the new standard in SEO for plastic surgeons. This allows your service pages to fully serve the intent of users that land on your website. For users and search engines to know if you’re truly a leader in your industry, you can’t use every page on your plastic surgery website to promote yourself. Instead, you should demonstrate your expertise by blogging about new industry practices, how your procedures work, and preparation/recovery tips for patients. This approach is called cosmetic surgery content marketing. Not only will publishing content around these topics help educate your prospects and current customers, but it will also help search engines verify that your website deserves to rank highly in the search results. 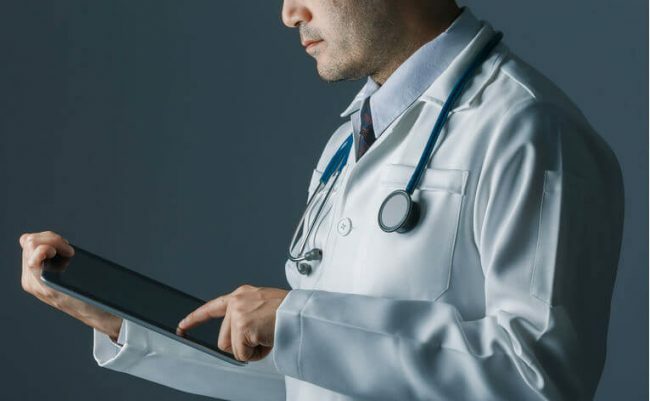 Writing and content creation isn’t just a department within your organization’s marketing team; it’s an informational bridge that emotionally connects potential patients to your practice’s bottom line. What is Content Marketing for Cosmetic Surgeons? Content marketing is when you create an educational piece of marketing collateral for your target audience. In digital marketing for plastic surgeons, this mainly entails web pages, your blog, eBooks, whitepapers and even informational email campaigns that cover subjects relating to plastic surgery and your individual medical practice. Content marketing positions you and your practice as an influencer in your market. When your potential customers use search engines to investigate solutions to their cosmetic problems, your content will be there to education them. Potential clients will come to know you as an expert, and trust you to perform their procedure when they are ready to buy. This type of inbound marketing for plastic surgeons can reduce your need for back-office workers. Your content marketing should leverage educational content and persuasive, emotionally stimulating insights to nurture potential patients through their customer journey. This results in quicker and more steady sales cycles, less administrative overhead, informed expectations about cosmetic surgery procedures, and more robust profits for your surgical practice. Content creation allows you to engineer a more trusting and informed following of potential patients. When you implement the right plastic surgery marketing ideas, you can prequalify your audience, and build trust that allows your practice to charge premium prices. High quality content lets you position your plastic surgery services as the industry-leading solution to their unique problems. This reduces commoditization of your offerings, and helps you avoid a competitive pricing race to the bottom. Interested in learning more about content marketing services for your practice? Contact MARION today. The content marketing on your website and related digital channels helps turn visitors into paying customers. An aesthetically pleasing website paired with compelling and influential content will keep would-be one time visitors coming back for more. Your content is a story-telling vehicle that can help customers realize that your cosmetic procedures are right for them. You then use your trust and thought leadership to motivate visitors to contacting your plastic surgery center. Blogging is an important way to tell your story, and inform readers about the advantages and disadvantages that certains procedures offer. Use top-of-funnel subjects to educate visitors about how certain procedures are performed. You can also use middle-of-funnel topics to talk about pricing comparisons, why your experience positions you as the reader’s plastic surgeon of choice, and why certain techniques are safer than others while providing the same outcome. Make sure you always write or hire a professional content marketing agency to create unique plastic surgery content. Simply curating, or even copying content that has been published elsewhere in the industry can be damaging to your brand, and will not help your website’s SEO. Search engine optimization guidelines indicate that unique content that highlights your medical practice’s insights is more useful than duplicate content. Create unique content that doesn’t stuff your target keywords into your website, and you’ll be on the right track to plastic surgery SEO and content marketing success. Content marketing for plastic surgeons should leverage unique selling points of your services. If you use a less expensive or more effective technique than your competitors, relay that information to your audience. If certain procedures have been proven not to stand the test of time, seize the opportunity to upsell your readers on a more expensive, but higher quality cosmetic operation. Content marketing is not a one-and-done tactic. Marketing with content is a long-term strategy that requires a time investment. A regular publishing schedule will indicate to both readers and search engines that you have frequent and meaningful insights to share. This can help position your cosmetic surgery practice as an industry leader. Your plastic surgery content marketing ties together strategies for search engine optimization, social media, and educational content for potential and existing patients. You can reduce the burden of frequently asked questions from your existing customer base, and attract new customers with the same set of content. You can also use your educational content assets to build loyalty and trust while promoting your brand to new audiences. Take a look at the following stats about the effectiveness of cosmetic surgery content marketing. Creating these personas will help you pin-point who you’re talking to, and better understand how to persuade them that your surgical services are exactly what they need. Content marketing professionals will always start with an audit of your existing content. This could be extensive if you have a broad existing base of cosmetic surgery information on your website. If your digital presence is fairly new, the audit will be quick. Your content creation will need to be informed by real data. After a content audit, content marketing services will determine the direction of your strategy by doing a competitive analysis. This may require analysis of competitors in your location, or within your niche (if you have one). This data can be used to improve the SEO underpinnings of your content marketing strategy, and inform your efforts about the most in-demand topics. Why Use Content Marketing at Your Practice? Content marketing allows you to sell thoughts and expertise that enrich your services and command premium pricing. This is the fastest way to building trust and generating demand for your services. How Much Will Content Marketing Cost Me? The cost of content marketing for plastic surgeons will depend on your business goals, location, and your level of involvement. Monthly fees could range between $3,000-$6,000 per month, or less if you are assisting in the content creation process. This typically includes content for SEO on your website, as well as social media and email content creation. The price of cosmetic surgery content marketing will hinge on your unique situation. Contact MARION marketing today for an individual quote on content marketing for your practice. How Is Content Marketing Effectiveness Measured? There are high-level indicators of success such as pageviews, new user count, click-through rates, and time-on-page, but these metrics only tell part of the story. At the end of the day, the effectiveness of plastic surgery content marketing is measured by return on investment. 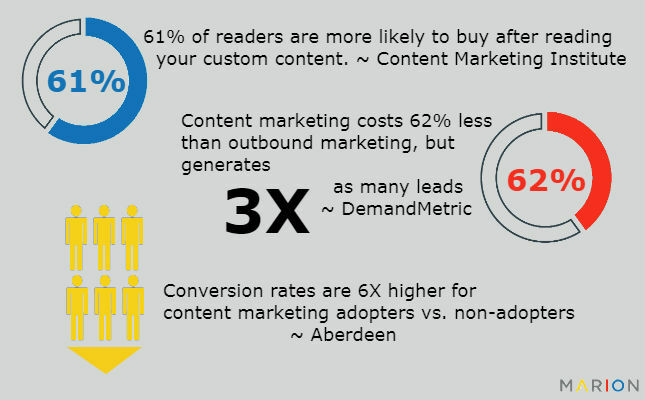 Which leads were you able to convert, and did you acquire those leads through content marketing? That will determine the success of your content marketing efforts. Content marketing and its SEO benefits are realized over the long term. When done properly, your content marketing strategy is tied to the operation and growth of your business in a highly meaningful way. It will take time to build content assets clustered around a surgical procedure that you offer, and then leverage that content to guide your audience to contact your practice. Most practices that use content marketing will begin to see real improvement in their bottom line after about 9 months, but your individual content plan and budget could make this happen sooner or later. What to Expect in the First Quarter? During the first three months of implementing content marketing, MARION follows a monthly update pattern that will keep you in the “know,” and help you keep a pulse on your content’s effectiveness. Our team is highly experienced in content marketing for plastic surgeons. Let us help drive your content creation, and give you the competitive edge you’ve been waiting for. Contact us today to speak with one of our experts about what content marketing can do for your practice. There are many benefits of blogging for business but better search rankings and educated customers who are willing to pay a premium for your expertise are two of the best reasons to start blogging today. The above is a screenshot of a content marketing campaign that MARION recently led for a Houston plastic surgeon. Through blogging and on-page SEO implementation, the client grew from 71 page one search engine rankings in January to 308 page one rankings in May. That’s a 231% increase in page one rankings in just four months! The final pillar of plastic surgery SEO is building links to your site. Links to your website are the digital equivalent of a new customer referral from a previous patient. A link building strategy will help speed up the process of acquiring backlinks from relevant websites that find your content useful. Link building is one of the most difficult pieces of plastic surgery internet marketing, because your services or advice have to be truly exceptional for a site owner to endorse you to their digital audience. The best starting point for link building is to have content worth linking to in the first place. Do competitive research with specialized online tools to learn which types of content garner links for your competitors. Then, create a version of your own that is more valuable and helpful to your target audience. Promote you content through email marketing, social media marketing and even direct email outreach to relevant professionals in the industry. Doing your own cosmetic surgery SEO requires a substantial amount of education on the latest SEO practices and a huge investment of time. Make the best use of your time and money by partnering with an experienced Houston SEO agency. Contact MARION today, and learn what our experts can do to turn your website into a revenue-generating machine.